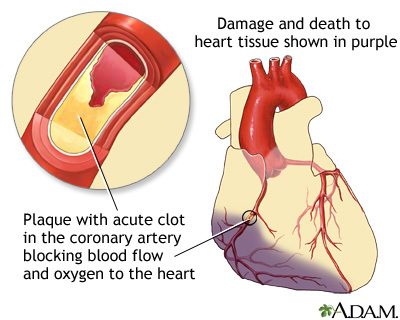 A heart attack occurs when blood flow to a part of your heart is blocked long enough that part of the heart muscle is damaged or dies. This article discusses what you need to do to take care of yourself after you leave the hospital. You were in the hospital because you had a heart attack. A heart attack occurs when blood flow to a part of your heart is blocked long enough that part of the heart muscle is damaged or dies. You may feel sad. You may feel anxious and as though you have to be very careful about what you do. All of these feelings are normal. They go away for most people after 2 or 3 weeks. You may also feel tired when you leave the hospital to go home. You should know the signs and symptoms of angina. You may feel pressure, squeezing, burning, or tightness in your chest. You may also notice these symptoms in your arms, shoulders, neck, jaw, throat, or back. Some people also feel discomfort in their back, shoulders, and stomach area. You may have indigestion or feel sick to your stomach. You may feel tired and be short of breath, sweaty, lightheaded, or weak. You may have angina during physical activity, such as climbing stairs or walking uphill, lifting, sexual activity, or when you are out in cold weather. It can also happen when you are resting or it can wake you up when you are sleeping. Know how to treat your chest pain when it happens. Talk with your health care provider about what to do. Take it easy for the first 4 to 6 weeks. Take 30 to 60 minutes to rest in the afternoon for first 4 to 6 weeks. Try to go to bed early and get plenty of sleep. Before starting to exercise, your provider may have you do an exercise test and recommend an exercise plan. This may happen before you leave the hospital or soon afterward. DO NOT change your exercise plan before talking with your provider. Your provider may refer you to cardiac rehabilitation program. There, you will learn how to slowly increase your exercise and how to take care of your heart disease. You should be able to talk comfortably when you are doing any activity, such as walking, setting the table, and doing laundry. If you cannot, stop the activity. Ask your provider about when you can return to work. Expect to be away from work for at least a week. Talk to your provider before engaging in sexual activity. Ask your provider when it is OK to start again. DO NOT take Viagra, Levitra, Cialis or any herbal remedy for erection problems without checking with your provider first. DO NOT drink any alcohol for at least 2 weeks. Ask your provider when you may start. Limit how much you drink. Women should have only 1 drink a day, and men should have no more than 2 a day. Try to drink alcohol only when you are eating. If you smoke, stop. Ask your provider for help quitting if you need it. DO NOT let anybody smoke in your home, since second-hand smoke can harm you. Try to stay away from things that are stressful for you. If you are feeling stressed all the time, or if you are feeling very sad, talk with your provider. They can refer you to a counselor. Have your drug prescriptions filled before you go home. It is very important that you take your drugs the way your provider told you to. DO NOT take any other drugs or herbal supplements without asking your provider first if they are safe for you. Take your medicines with water. DO NOT take them with grapefruit juice, since it may change how your body absorbs certain medicines. Ask your provider or pharmacist for more information about this. Antiplatelets drugs (blood thinners), such as aspirin, clopidogrel (Plavix), warfarin (Coumadin), prasugrel (Efient), or ticagrelor (Brilinta) to help keep your blood from clotting. Beta-blockers and ACE inhibitor medicines to help protect your heart. Statins or other drugs to lower your cholesterol. DO NOT suddenly stop taking these medicines for your heart. DO NOT stop taking medicines for your diabetes, high blood pressure, or any other medical conditions you may have without talking with your provider first. If you are taking a blood thinner such as warfarin (Coumadin), you may need to have extra blood tests on a regular basis to make sure your dose is correct. Bohula EA, Morrow DA. ST-elevation myocardial infarction: management. In: Zipes DP, Libby P, Bonow RO, Mann DL, Tomaselli GF, Braunwald E, eds. Braunwald's Heart Disease: A Textbook of Cardiovascular Medicine. 11th ed. Philadelphia, PA: Elsevier; 2019:chap 59. Fihn SD, Gardin JM, Abrams J, et al. 2012 ACCF/AHA/ACP/AATS/PCNA/SCAI/STS guideline for the diagnosis and management of patients with stable ischemic heart disease: a report of the American College of Cardiology Foundation/American Heart Association Task Force on practice guidelines, and the American College of Physicians, American Association for Thoracic Surgery, Preventive Cardiovascular Nurses Association, Society for Cardiovascular Angiography and Interventions, and Society of Thoracic Surgeons. Circulation. 2014;130:1749-1767. PMID: 25070666 www.ncbi.nlm.nih.gov/pubmed/25070666. Giugliano RP, Braunwald E. Non-ST elevation acute coronary syndromes. In: Zipes DP, Libby P, Bonow RO, Mann DL, Tomaselli GF, Braunwald E, eds. Braunwald's Heart Disease: A Textbook of Cardiovascular Medicine. 11th ed. Philadelphia, PA: Elsevier; 2019:chap 60.